Each day there are more techniques for marijuana cultivation available within the international cannabis scene. This system is perfectly adaptable to marijuana cultivation producing harvests of maximum quality, like those of hydroponic systems, but with the flavour and aroma of organic cultivation. Now is the time to choose your preferred cannabis variety and try your hand at this new proposal from the team at Alchimiaweb. In this method the fish supply the water with rich nutrients and bacteria transforms their faeces into a rich food source for our plants. The bacteria decompose the aforementioned excrements through a process which converts them into accessible nutrients for the plants. 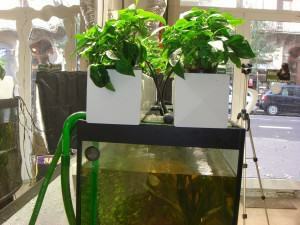 This, together with a hydroponic plant set-up, creates a self-sustaining, re-circulatory system that feeds both your plants and reduces toxic build-up in the fish-tank. With the roots suspended in the hydroponic system, the system itself acts as a bio-filter, improving the water quality in the fish-tank. 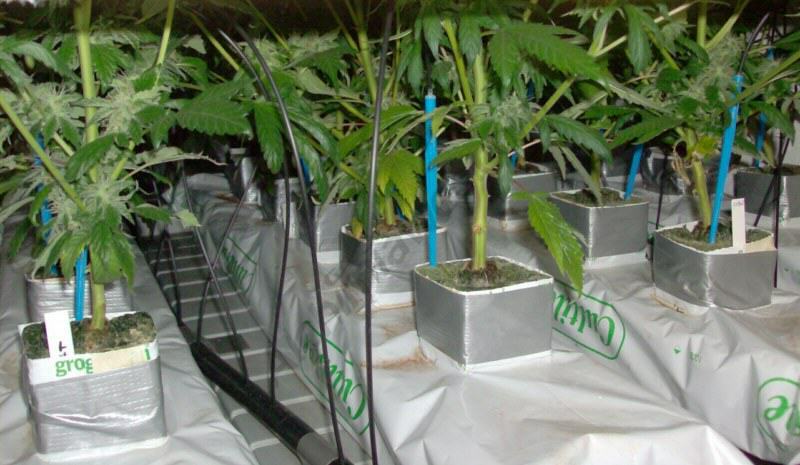 Plant selection: Always use a variety of marijuana that adapts well to the hydroponic system. Sativa-indica varieties, such as marihuana Amnesika 2.0 from Philosopher Seeds, give their best results when grown with this system. The case in the photos shows edible vegetables, with nutritional characteristics similar to those of marijuana, this is because the system was on display in a shop. As marijuana is illegal, it was not possible to cultivate said species. Fish selection: Aquaponic systems use many different fish species, both cold water and tropical fish. The most used are: Carassius auratus auratus (goldfish) and Cyprinus carpio (koi) in cold water and Astronotus Ocellatus (oscar) o, Siruliforme (catfish) in warm water, for these fish a water heater is needed. These are species that are tolerant to fluctuations in water temperature, pH, oxygen levels and dissolved solids. The case shown uses Astronotus Ocellatus (oscar) which grows quickly and has an insatiable apatite. 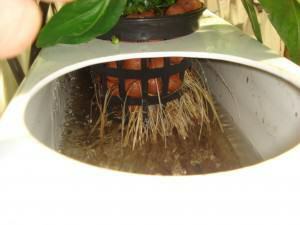 Water quality: Aquaponic systems require an exhaustive water quality control. 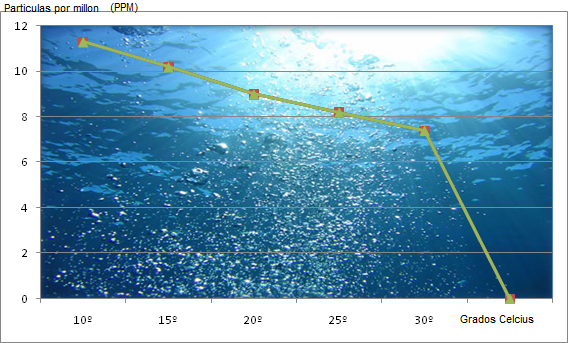 This includes the parameters of dissolved oxygen, carbon dioxide, ammonia, nitrates, pH, chlorine, and others. 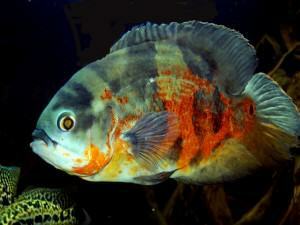 The particular characteristics will depend on the fish and plant species used. Bio-filtration, suspended solids: the faeces in these systems contain nutrients, dissolved solids and other by-products. The bio-filters are designed to capture these suspended solids in the water, facilitating nitrification, and converting these solids to food available to the plants. This plays an essential role in this type of cultivation. Nitrification Process: This is one of the most important elements that enable the system to function correctly, reducing the toxicity of the water for the fish by transforming ammonia into a rich fertilizer for our plants. Thanks to the nitrosomonas that convert ammonia into nitrites and nitrifying bacteria the convert nitrites into nitrates, the plants can feed and the ammonia levels in the fish-tank are reduced keeping them at safe levels for the fish. These bacteria also offer root protection to the plants. Proportion: This refers to the proportion of the volume of water in the fish-tank to the total volume of the hydroponic medium. This tends to be half, i.e. the fish-tank should be twice as big as the cultivation system. There are some, easily available, materials needed for the system to operate successfully. A hydroponic cultivation system: There are various systems and techniques. You should use the system that fits best in the space you have. Remember that the proportion of the fish-tank to hydroponic system should be double. Fish-tank: You can use any deposit that will withstand the water pressure. 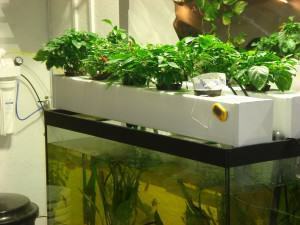 For indoor grows using an artificial light source, it’s better to use a fish-tank so you can see the fish. Water pump: The capacity of the water pump should be greater or equal to the size of the fish-tank, if the pump has a greater capacity it will help the system to function well. Make sure it is installed at the bottom of the fish-tank so it can easily absorb any dissolved solids and effectively reduce the ammonia level in the water. Bio-filter: This is the most important part of the system. 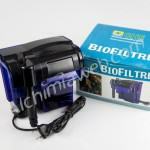 The bacteria responsible for converting ammonia to nitrates that can be used by the plants are found within the filter. Therefore establishing a healthy colony of bacteria that can effectively clean the water and feed the plants is the key to attaining high quality harvests. It normally takes 3 to 6 months for the bacteria colony to reach optimum levels. Aquaponia allows you to farm organically, as though you were planting in the ground, but offers the growth and production levels of a hydroponic system. Moreover, the system offers the advantage of being alive and you can control the nutritional cycle of the plants, without having to buy fertilizers that otherwise would be necessary. The system creates a symbiosis between the plants and the fish and this balance, when the previously mentioned instructions are followed, will produce spectacular results. 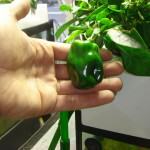 You should try this innovative and passionate technique brought to you by the team at Alchimiaweb, and share your aquaponic experiences with them. Diver,S.2006. 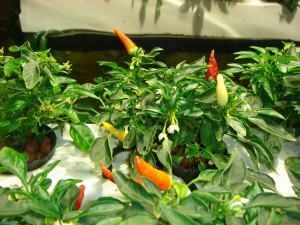 Aquaponics-Integration of Hydroponics with Aquaculture. Rackocy J,1999. The status of aaquaponics part1. Aquaculture Magazine 25 (4):83-88.